GENERAL NOTES VIEWING The sale animals may be inspected prior to the sale by appointment with the Vendors. DIRECTIONS: The sale will be held at Sedgemoor Auction Centre, North Petherton, Bridgwater, Somerset TA6 6DF. FROM M5 JUNCTION 24: (Travelling North) Take the first exit off of the roundabout, *keep in the left hand lane and take the first exit off the next roundabout onto the A38 and the market entrance is located on the left hand side at the traffic lights. Continue along estate road to a statue of a bull. The market car park is found immediately beyond. FROM M5 JUNCTION 24: (Travelling South) Take the third exit and proceed as above * REFRESHMENTS: Available from our market restaurant Food on the Level. ACCOMMODATION: Walnut Tree Hotel, 87 Fore Street, North Petherton (M5, J24) Tel: 01278 662255 Travelodge, Huntworth, Bridgwater TA6 6TS (M5, J24) Tel: 0871 984 6243 Lower Farm, Thornfalcon, Taunton TA3 5NR (M5, J24) Tel: 01823 443549 Mr & Mrs John Titman Blackmore Farm, Blackmore Lane, Cannington, Bridgwater TA5 2NE Tel: 01278 653442 Mrs Ann Dyer Brookhayes Farm, Bell Lane, Cossington, Bridgwater TA7 8LR Tel: 01278 722559 Mrs Bell CONDITIONS OF SALE: All sheep are sold under the Livestock Auctioneers Association conditions of sale, which are displayed outside the market office. For any sheep purchased as Birth Notified only, it is the full responsibility of the Purchaser to pay any further fees to allow full pedigree status. DELIVERY OF STOCK: On Vendors arrival at the market, if bringing MV Accredited stock, please do not unload until your MV certificate has been collected. A valid copy of your MV certificate must be handed to the booking in clerk, with individual ear tag numbers detailed upon the certificate. Please book in your stock with the clerk and provide your movement licence and entry form. Your pens will be allocated as per this catalogue. 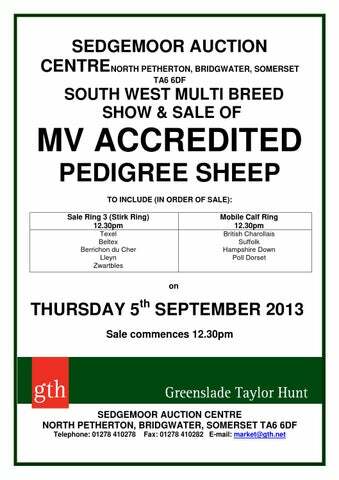 SEDGEMOOR AUCTION CENTRE CPH No: 36/064/8002 METHOD OF SALE: All pedigree registered sheep will be sold in guineas (105 pence). All sheep must be paid for on the day and no stock may leave the market without a ‘Pass Out’ which is only obtainable from the market office. Any sheep rejected on inspection will be sold at the end of the respective breed. BUYERS NUMBERS: Buyers numbers are available from the market office. In order to set up an account with Greenslade Taylor Hunt you must produce two forms of identification by means of any of the following: drivers licence, recent utility bill from within the last 6 months or your passport or shot gun/firearms licence. WOTTON Comments: Further details available at time of sale. LOOSEBEARE Further details at time of sale. ELMWICK Further details at time of sale. OLDER EWE MR & MRS AJ WRAYFORD Wotton Heptavac P System. Treated with CLiK 21st June 2013. Schmallenberg vaccinated 23rd July 2013. Pens 606-607 Lot 916 WOTTON 11ZVT.00262 Twin Date of Birth: 22.02.2011 Sire: Castellau Jacobin (TZ9118) Dam: (ZVT9070) Comments: Scrapie Genotype ARR/ARR. WOTTON ZVT.0063 Single Date of Birth: 22.02.2010 Sire: Hayden Humphrey (XZP7001) Dam: (ZVT5001) Comments: Scrapie Genotype ARR/ARR. WOTTON ZVT.00069 Twin Date of Birth: 16.03.2010 Sire: Edstaston Hobson (TG7053) Dam: (ZVT7017) Comments: Scrapie Genotype ARR/ARQ. WOTTON ZVT.0101 Twin Date of Birth: 16.03.2010 Sire: Hayden Humphrey (XZP7001) Dam: (ZVT8037) Comments: Scrapie Genotype ARR/ARR. WOTTON ZVT.00102 Twin Date of Birth: 16.03.2010 Sire: Hayden Humphrey (XZP7001) Dam: (ZVT8037) Comments: Scrapie Genotype ARR/ARR. WOTTON 12ZVT.00363 Twin Date of Birth: 12.02.2012 Sire: Wotton Karatus (ZVT0035) Dam: (ZVT8004) Comments: Scrapie Genotype ARR/ARQ. WOTTON 12ZVT.00316 Twin Date of Birth: 02.02.2012 Sire: Wotton Karatus (ZVT0035) Dam: (ZVT0063) Comments: Scrapie Genotype ARR/ARR. WOTTON 12ZVT.00398 Single Date of Birth: 24.03.2012 Sire: Cold Harbour Icarus (ZXW8003) Dam: (ZVT8071) Comments: Scrapie Genotype ARR/ARR. PROUD TO SPONSOR THE SUFFOLKS AGAIN THIS YEAR The Highest Placed Ram from a West Country Suffolk Sheep Association Member will be presented with a Cup kindly sponsored by MSD Intervet SHEARLING RAM Kindly Sponsored by MSD Intervet MR M SMITH Knightswood Pen 612 Lot 1001 KNIGHTSWOOD Further details at time of sale. Lot 1002 KNIGHTSWOOD Further details at time of sale. SJV FAUX FARMS Martinsell Heptavac P System. Pens 613-614 Lot 1003 MARTINSELL 91X:12:079 Twin Date of Birth: 22.03.2012 Sire: Bentley Bean The Second (239:L25) Dam: 91X:D34 Comments: Performance Recorded Index 3:17. Lot 1004 MARTINSELL 91X:12:108 Twin Date of Birth: 11.04.2012 Sire: Bentley Bean The Second (239:L25) Dam: 91X:K68 Comments: Performance Recorded Index 3:16. Lot 1005 MARTINSELL 91X:12:099 TBA Date of Birth: 01.04.2012 Sire: Bentley Bean The Second (239:L25) Dam: 91X:K26 Comments: Performance Recorded Index 3:11. Lot 1006 MARTINSELL 91X:12:008 Twin Date of Birth: 13.03.2012 Sire: Bentley The Buccaneer (239:N72) Dam: 91X:N110 Comments: Performance Recorded Index 3:65. Comments: 3rd prize at Bath & West Show as a lamb. Dam Reserve Champion at Bath & West Show 2012. Lot 1008 MOGFORD PSJ:12:016 Twin Date of Birth: 06.01.2012 Sire: Brightonhouse Seventy Seven Dam: J16 by Glenhead Morangie Comments: Dam J 16 is one of the best breeding ewes in our flock. Lot 1009 MOGFORD PSJ:12:019 Twin Date of Birth: 06.01.2012 Sire: Rookery Rooney Dam: N143 by Glenhead Golden Phoenix Comments: Sired by 2300gns Rookery Rooney, sire of the year 2012. MRS K HILL Sampfordel Birth Notified, top 10% Signet recorded. Heptavac P System, treated with CLiK 25th July 2013. Pens 616-617 Lot 1010 SAMPFORDEL Date of Birth: February 2012 Further details at time of sale. Lot 1011 SAMPFORDEL Date of Birth: February 2012 Further details at time of sale. Lot 1012 SAMPFORDEL Date of Birth: February 2012 Further details at time of sale. Lot 1013 SAMPFORDEL Date of Birth: February 2012 Further details at time of sale. Lot 1014 SAMPFORDEL Date of Birth: February 2012 Further details at time of sale. MR ST PIERCE Abbotside Pen 618-619 Lot 1015 ABBOTSIDE Further details at time of sale. Lot 1016 ABBOTSIDE Further details at time of sale. Lot 1017 ABBOTSIDE Further details at time of sale. Lot 1018 ABBOTSIDE Further details at time of sale. Lot 1019 ABBOTSIDE Further details at time of sale. Lot 1020 ABBOTSIDE Further details at time of sale. MRS J CORNOCK Redhouse Pen 620 Lot 1021 REDHOUSE Further details at time of sale. SEAFIELD PEDIGREES Seafield Pen 621 Lot 1022 SEAFIELD Further details at time of sale. Lot 1023 SEAFIELD Further details at time of sale. Lot 1024 SEAFIELD Further details at time of sale. Lot 1025 SEAFIELD Further details at time of sale. Lot 1026 SEAFIELD Further details at time of sale. Lot 1034 REDHOUSE LXH1314 244 Twin Date of Birth: 15.01.2013 Sire: Birness The Games Maker (W112 20) by Meikleson Square Up Dam: LXH11 02 by Conveth MacLaren Lot 1035 REDHOUSE LXH13 22 252 Twin Date of Birth: 02.02.2013 Sire: Tomcroft Avenger (LAS 1118) by Stockton Joint Venture Dam: 138 N37 by Birness Buckaroo Lot 1036 REDHOUSE LXH13 24 254 Twin Date of Birth: 15.02.2013 Sire: Tomcroft Avenger (LAS 1118) by Stockton Joint Venture Dam: LXN N12 by Conveth MacLaren MRS A MOGFORD Mogford Heptavac P+. Regularly wormed and treated with CLiK. Pen 626 Lot 1037 MOGFORD PSJ:13:040 Single Date of Birth: 07.01.2013 Sire: Baileys Brigadier The Second Dam: L4 by Cairness Coldplay Comments: Sired by 8000gns Baileys Brigadier The Second. Lot 1038 MOGFORD PSJ:13:007 Single Date of Birth: 03.01.2013 Sire: Kings High n Mighty Dam: N17 by Cairness Achievement Comments: Sired by 24000gns Kings High n Mighty. Lot 1039 MOGFORD PSJ:12:020 Twin Date of Birth: 05.01.2013 Sire: Baileys Brigadier The Second Dam: P44 by Deveronside Destroyer Comments: 5th at Devon County Show 2013. Sired by 8000gns Baileys Brigadier The Second. Comments: Sire purchased for 1400gns 2011, sired by Strathisla Speed. Lot 1043 HUKELEY HRN:N16 Single Date of Birth: 12.01.2010 Sire: Limestone Pedrosa Dam: J54 by Castlewellan Cruz SHEARLING EWE MRS K HILL Sampfordel Birth Notified, top 10% Signet recorded. Heptavac P System, treated with CLiK 25th July 2013. Schmallenberg vaccinated. To be sold in pairs. Pens 23-22 Lot 1044 SAMPFORDEL Date of Birth: February 2012 Further details at time of sale. Lot 1045 SAMPFORDEL Date of Birth: February 2012 Further details at time of sale. Lot 1046 SAMPFORDEL Date of Birth: February 2012 Further details at time of sale. Lot 1047 SAMPFORDEL Date of Birth: February 2012 Further details at time of sale. Comments: Performance Recorded Index 3:13. Lot 1051 MARTINSELL 91X:12:046 Triplet Date of Birth: 23.03.2012 Sire: Martinsell Ten Sixty Six (91X:266) Dam: 91X:H47 Comments: Performance Recorded. SUFFOLK X RAM LAMBS SEAFIELD PEDIGREES Seafield Pen 19 Lot 1052 SEAFIELD Further details at time of sale. Lot 1053 SEAFIELD Further details at time of sale. Lot 1054 SEAFIELD Further details at time of sale. Lot 1055 SEAFIELD Further details at time of sale. Lot 1056 SEAFIELD Further details at time of sale. HAMPSHIRE DOWN SHEARLING RAM HC DERRYMAN & SONS Yarcombe Pen 17 Lot 1057 YARCOMBE Further details at time of sale. Lot 1058 YARCOMBE Further details at time of sale. WRAXALL Further details available at time of sale. OLDER RAM MG & JH MANN Mannkind Heptavac P System. Pens 701-702 Lot 1100 MANNKIND STEEL MAN IMM1100.455 Single Date of Birth: 20.03.2011 Sire: IMM07.3384 by Pemberlan Jack Dam: TNS06.045 Salocin ewe by Loosebeare Just Right Comments: Proven ram. Purchaser to contact Vendor for Pedigree certificate. Lot 1102 MANNKIND STAVROS IMM1100.473 Twin Date of Birth: 25.03.2011 Sire: IMM07.3367 by Pemberlan Jack Dam: ZMM08.3807 by Loosebeare Mr Andrew Comments: Purchaser to contact Vendor for Pedigree certificate. Lot 1103 MANNKIND RAMSDEN IMM100.00053 Single Date of Birth: 27.03.2010 Sire: Mannkind Oberon (IMM08.3722) by Scolton Lion King Dam: TNS06.034 by Loosebeare Just Right Comments: Birth notified. Proven ram. Lot 1104 MANNKIND REGAL IMM100.00069 Twin Date of Birth: 31.03.2010 Sire: Mannkind Obed (IMM08.3738) by Bettonfield Janitor Dam: QEL06.350 by Penparc Land Rover Comments: Birth notified. Proven ram. SHEARLING RAM MG & JH MANN Mannkind Heptavac P System. Pen 703 Lot 1105 MANNKIND TERRENCE IMM12.00839 Single Date of Birth: 08.03.2012 Sire: IMM07.3367 by Pemberlan Jack Dam: IMM12.00839 Comments: Birth notified. Lot 1106 MANNKIND TRENT IMM12.00848 Twin Date of Birth: 13.03.2012 Sire: IMM07.3367 by Pemberlan Jack Dam: TNS06.045 by Loosebeare Just Right Comments: Birth notified. Lot 1107 MANNKIND TROY IMM12.00850 Single Date of Birth: 13.03.2012 Sire: IMM07.3367 by Pemberlan Jack Dam: IMM08.3807 by Loosebeare Mr Andrew Comments: Birth notified. MR BJ GRUITT Ladyswood Pen 704 Lot 1108 LADYSWOOD TOP NOTCH XBG1200154 Single Date of Birth: 07.02.2012 Sire: Cambwell Romulus (LTC10.00075) Dam: Ladyswood (XBG08.1847) Comments: Sire purchased for 4200gns at the English National. Comments: Sired by Barnage Peter who has sired lambs to 1,050gns. MR A DUFOSEE & FAMILY Deverill Pens 712-713 Lot 1126 DEVERILL Further details at time of sale. Lot 1127 DEVERILL Further details at time of sale. Lot 1128 DEVERILL Further details at time of sale. Lot 1129 DEVERILL Further details at time of sale. Lot 1130 DEVERILL Further details at time of sale. Lot 1131 DEVERILL Further details at time of sale. RAM LAMB AC & D GROSSEY Lower Sea Pen 716 Lot 1135 LOWER SEA Further details at time of sale. Lot 1136 LOWER SEA Further details at time of sale. SHEARLING EWE MR BJ GRUITT Ladyswood Pen 718 Lot 1138 LADYSWOOD XBG12.00155 Twin Date of Birth: 07.02.2012 Sire: Cambwell Romulus (LTC10.00075) Dam: Ladyswood (XBG10.00025) Comments: Sire purchased for 4200gns at the English National. Lot 1139 LADYSWOOD XBG12.00139 Twin Date of Birth: TBA Sire: Cambwell Romulus (LTC10.00075) Dam: Ladyswood (XBG10.00008) Comments: Sire purchased for 4200gns at the English National. CHARTEX SHEARLING RAM MR A DUFOSEE & FAMILY Deverill Pen 726 Lot 1147 1 RAM Further details at time of sale. Lot 1148 1 RAM Further details at time of sale. WRAXALL Further details at time of sale. Lot 1155 SWINCOMBE YEO12.571 Twin Date of Birth: Late March 2012 Sire: Griffel Kipper EWB10.129 Dam: YEO09.74 Lot 1156 SWINCOMBE YEO12.544 Twin Date of Birth: Late March 2012 Sire: Henalt Jack JSC09-004 Dam: YEO10.140 Comments: Sire Reserve Interbreed Royal Welsh 2012. Comments: Entered New Forest and Gillingham & Shaftesbury Show. Comments: 3rd at New Forest Show in the Continental Ewe Lamb class. Entered at Gillingham & Shaftesbury Show.